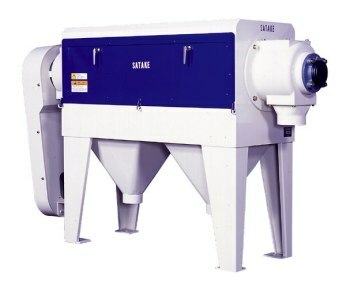 The Satake SHSA Horizontal Scourer has been engineered to provide a thorough scouring and impacting effect on grain and is used in various places within grain cleaning plants. The machine will effectively remove outer husks and crease dirt by its intense scouring action and will reduce in size and therefore remove through the sieve apertures any mudballs, small friable seed impurities and any insect fragments. Similarly the impactor/scourer will break the weaker, insect damaged kernels and effectively eliminate them. By removal of these impurities the SHSA provides more hygienic storage conditions within the cleaning and tempering sections and will reduce the colour, ash, filth and micro organism content of the final products milled from the grain.